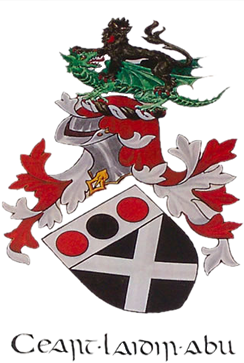 This site is online to commemorate the lives of the children of Robert Persse Fitz-Patrick (son of Rev. Frederick Fitz- Patrick and Lady Olivia Taylour) and Caroline Rebecca Moore (daughter of Arthur Moore, Dean of Anchonry). Bob and Carrie were married in 1885. They had five children together*: Arthur Headfort Persse, Olivia Gladys, Frederick George Hugo, Edwina Lillian and Edward Louis Moore (my grandfather). I dedicate this site to his memory. 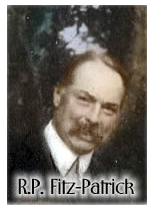 I developed this site in response to the increasing interest in genealogy generally, and in my branch of the Fitz-Patrick family in particular, which, I am told, is generally referred to as the Noble Line, because of our descendency from Bryan Mac Giolla Phádraig (Fitz-Patrick) Lord and First Baron of Upper Ossory. I was made aware of this renewed interest by Fitzpatrick aficionados Ronn Fitzpatrick and Steve Zalewski, who have collaborated on and published a descendancy of Bryan Fitzpatrick Lord and 1st Baron of Upper Ossory, and operate the Mac Giolla Phádraig Clan Society. Lastly, I have no financial interest in any of the products or books linked to within this site. The links are for further informational or personal resources only. * Robert remarried after he was widowed and had a second family of four children with Margaret Augusta... the children were:Doreen Lettice Constance, Heremon Douglas, Desmond Frederick and Harry. **Also worth noting: Robert's sister was Mary Cornwallis-West, and his niece was Princess Daisy of Pless.